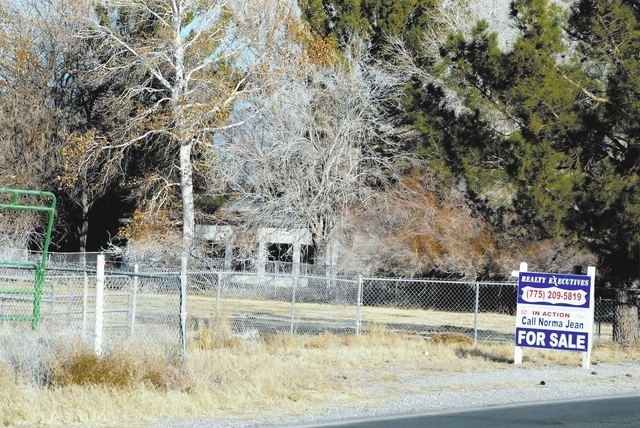 The teaser is seeking buyers for the Binion Ranch, a 138-acre parcel in the middle of Pahrump that’s up for sale for $2.2 million, according to Realtor Norma Jean Opatik of Realty Executives. The advertisement correctly states the property was owned by a famous person who brought national attention to Pahrump and Nye County. The property was transferred to the Lonnie “Ted” Binion trust in October 2011 under the latest transaction on file at the Nye County Assessor’s Office after being owned by Binion himself. Ted Binion was the son of Las Vegas gambling tycoon Benny Binion, the founder of the famed Horseshoe Casino. Ted Binion’s death in Las Vegas on Sept. 17, 1998 was questionable. Binion’s girlfriend Sandy Murphy and her boyfriend Rick Tabish were convicted of murder, but later acquitted in a trial that was front page news for months in Nevada and attracted nationwide publicity. The defense theory was Binion died of a heroin overdose. Author John L. Smith’s biography of former Las Vegas mayor and mob lawyer Oscar Goodman, “Of Rats and Men,” said Binion was on the verge of breaking up with Murphy, a former stripper at Cheetah’s Nightclub, when he died. The clandestine relationship between Murphy and Tabish was discovered by a private investigator after the estranged sister, Becky Binion Behnen, suspected foul play. The tale became much juicier for locals when Tabish was arrested digging up $7 million in silver coins buried in a vault on what is now the Pahrump Nugget Casino property a few days after Binion’s death. At the time, there were only remains of a cotton gin on the site. Tales of buried loot on the Binion Ranch have flourished over the years. In September 1999, Nye County sheriff’s deputies investigated two freshly dug holes on the Binion Ranch, believed to have been dug up by intruders looking for treasure. Deputies were called after a trespassing report was filed by ranch manager Ed Raap. A new deputy who just began work at the Nye County Sheriff’s Office on Aug. 4, 1999, now sheriff Tony DeMeo, took the report. “I was out there as a deputy. The holes were kind of superficial, they weren’t that far down, it looked like somebody quick-dug a couple of holes to see if they could find anything. The rumor was out Binion buried money out there so he could dig it up and spend it,” DeMeo said. DeMeo said Raap told him there was nothing there. At the time, he said the sheriff’s office received calls occasionally about trespassers walking on the ranch looking for any buried loot, but none were ever arrested. The Las Vegas Sun, in a Sept. 22, 1999 article about that incident, reported Binion’s longtime secretary, Cathy Rose, told private detective Tom Dillard, who worked for the Binion estate, she received a phone call from Murphy less than two weeks after Binion’s death in which Murphy suggested she knew where Binion buried property under a tree at the ranch. The newspaper account said homicide detectives found a map of Binion’s ranch when they executed search warrants at a Green Valley apartment Murphy and Tabish shared. Former Nye County Sheriff Wade Lieseke Jr. testified at Murphy and Tabish’s preliminary hearing that Binion told him two weeks before his death that he buried property on his ranch under trees near an irrigation system. Lieseke had Binion’s contact information in case there was a problem at the ranch. In his book on the history of Pahrump, author Bob McCracken said Benny Binion bought the property from scavenger Robert Doby Caudill (Doby Doc), a colorful character who collected antiques and western memorabilia. 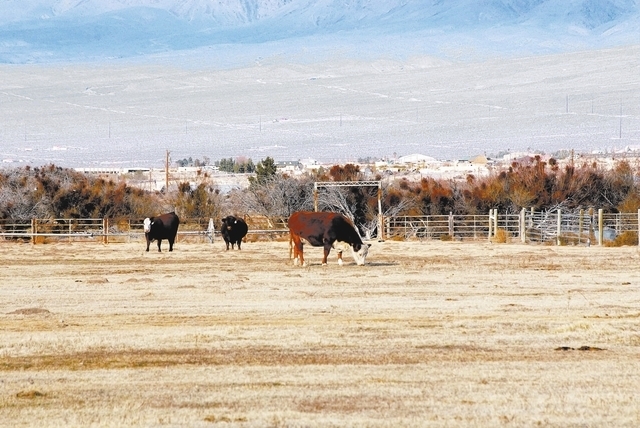 He purchased the ranch from Pahrump pioneer “Pop” Buol and moved to Pahrump in the 1960s. McCracken said the Binions purchased the ranch from Doby Doc before his death and used it to winter horses normally kept at their Montana ranch in the summer. The ranch had over 100 head of horses and a beautifully-polished stagecoach, long-time resident Harry Ford, now deceased, told McCracken. Ford said there were also grape vines and fruit trees on the property. Former Binion Ranch manager Dave Mattsen, now 69 — who was arrested, then later acquitted along with Tabish and Mike Milot in the silver theft caper — said Benny Binion acquired the ranch when he got out of prison on income tax problems after Doby Doc was accused of skimming money. McCracken’s book states Doby Doc was hired by the Binions to help run the Horseshoe Casino and drove into Las Vegas from Pahrump to count the money. Mattsen said there were a number of animals on the ranch, including numerous simitars, black buck antelope, peacocks and Norwegian white-tailed deer. They eventually were shipped off to California animal sanctuary PAWS, Pet Awareness and Welfare Services, he said. There are some peculiar fixtures around the ranch, Mattsen said, because Doby Doc had the Cold War paranoia about the Soviet Union when people were encouraged to build bomb shelters. Mattsen said there was a 300-foot deep well on the property that pumped pure artesian water. Opatik said it’s now being farmed just enough to keep the water rights. A security guard still lives on the property, she added. Mattsen said he knew Ted Binion from when he was 15 years old and living in Montana, Binion was 17. Mattsen regretted being jailed for seven days after the silver vault incident, missing his funeral. “I got a call in the middle of the night. Somebody’s digging up at the cotton gin. Guess whose truck was there? Rick Tabish’s,” Mattsen said. Tabish, a contractor, buried the vault, Mattsen said. He claims only three people had the combination: Binion, Tabish and himself. “He never shot heroin, he smoked it. He was scared to death of needles,” Mattsen said, of his long-time friend Binion. Mattsen still suspects his friend was murdered. Mattsen said he was with Ted Binion and Tony Spilotro’s former bodyguard, “Fat Herbie” Blitzstein, when they went into Cheetah’s Nightclub in Las Vegas and met Sandy Murphy for the first time. “Ted always carried $5,000, $4,000 in his pockets because he didn’t like checks,” Mattsen said, adding Murphy told him she had a gambling debt. That led former sheriff Lieseke to question why Mattsen then hasn’t tried to excavate the loot himself. Mattsen said the current ranch manager won’t let him even get a saddle from the ranch.